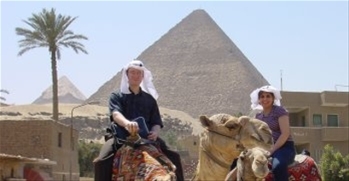 In April 2004 my wife and I traveled to Egypt on our honeymoon, we stayed in Cairo and Luxor visiting ancient sites. We took a bare minimum of Baha’i literature with us, a couple of prayer books and a selection of Baha’i Writings, and we didn’t mention our religion to anybody. While the historical treasures of Egypt are intriguing we were quite surprised at the widespread lack of respect that people had for us and for the name of Islam. Men often pushed Ladan with their shoulders in disgust, she felt, of her western dress as they walked past her. People tried to solicit extortionate amounts of money from us at every turn, even at mosques, often using trickery and lies. I will never forget the man who insisted he knew a short cut to the Egyptian museum and walked us on a long detour repeating continuously that because of his Muslim Faith he loved to help out visitors. Having walked us half a mile to a point 20 meters further down the road from where we had started he pointed in the direction of the museum and wanted payment for his “Muslim” act of kindness. Although we returned from Egypt with some amazing memories and photos the enjoyment was somewhat dampened by the fact that we felt we had not been treated so much as humans but rather as some sort of third class citizens unworthy of being treated with honesty or respect. This is not to say that we did not meet some very nice people too, but it was clear that the demeaning treatment we received was seen as acceptable treatment of outsiders visiting the country. I was unsure if the lack of respect we received was down to us being tourists or non-Muslims, but something seemed to give people the feeling that they had a genuine right to treat us as lesser people. With this experience in our past I have been somewhat glued to the “Baha’i Faith in Egypt” blog for many months (authored by Bilo, pictured right as a younger man). It is the first blog I check in the mornings for updates. In Egypt there is actually a debate over whether or not followers of the Baha’i Faith should have the same rights as citizens who follow Islam or a religion that preceded Islam. While the idea that Baha’is should not have equal rights may be prevalent in many other Islamic countries, the debate in Egypt is very open and can be read about in public newspapers or even seen on television. The bulk of the debate centres around the Egyptian ID card, a central element to the rights of Egyptian citizens, which includes on it the religion of the holder. Baha’is cannot have an ID card with “Baha’i” listed on it as The Baha’i Faith is not recognised as a religion in Egypt. The debate started becoming more public when a Baha’i couple in Egypt won the rights in a court to have their religion correctly identified on their ID cards. The government appealed against the decision and the Supreme Administrative Court were set to hear the case on 19th June. The case has been repeatedly postponed as the government have not managed to prepare a required report on the matter before any of the dates set for the case. The hearing is now set to be re-convened on 20th November this year. Since that first hearing there have been newspaper articles published against the Baha’is, there was a book published in June which called for action against the Baha’i Faith and even appeared to call for the killing of Baha’is. A conference was held in Cairo at the start of August to look at the possibility of removing religion from ID cards which gave rise to some further tv and newspaper coverage of the Baha’i human rights issue. The articles in the media seem to have become clearer that the choice for Egypt is between accepting the universally accepted stand-point that all human beings should have the same basic rights, or being seen as a sectarian society where a person’s religion can cause them to lose their human rights. Recently the author of the book published against the Baha’is in June filed a formal complaint to Egypt’s Attorney General suggesting that the Baha’is were defaming him by stating what they had read in his book. In response Egypt’s Baha’is have now issued a formal complaint to President Mubarak accusing the author of fabrication and forgery. The “Baha’i Faith in Egypt” blog makes this whole story accessible to non-Arabic speakers outside Egypt who are concerned for the Baha’is and/or human rights. While relatively small in number, the Egyptian Baha’is appear to have brought serious deep-seated beliefs and values into the spotlight for analysis. One can only hope and pray that humanity wins over fanaticism in this debate which lies so close to the hearts of many on both sides of the argument. My husband (Baha’i Views)and I also read “Baha’is in Egypt”, and continue to hope that things will go better there for the Baha’is. Here in the west, we take our freedoms for granted. Having lived in Egypt, I recognize what you’re talking about regarding your experience on your honeymoon. The behavior you encountered was pretty normal. The problem may have been that you were spending most or all your time in tourist areas. The tourist sector in Egypt attracts a relatively high proportion of lowlifes. They see foreign tourists as an easy way to make a buck. If it makes you feel any better, they target anyone who they think they can take advantage of – Westerners, Japanese, foreign Arabs. Egyptians from the countryside get conned too, but not as tourists. Anything to make a buck. Most Egyptians are decent people, albeit a little odd, and they treat their friends and their guests with respect and consideration. As for your wife being jostled on the street – that probably wasn’t because of her Western dress. Egyptians expect foreign women to dress like foreigners, as long as they dress modestly (e.g. shoulders covered, high neckline, long pants or long skirts). If anything, they were jostling her just to feel her body. Most Egyptian men ogle women and touch them when they get the chance. That’s especially true of foreign women because they’re more likely to get away with it, but it happens to Egyptian women too. So the lack of respect you received was because you were tourists, not because you were non-Muslims. Let it be said that fanaticism and bigotry today stand between humanity and its unification. It is mind-boggling while Muslims so adamantly and aggressively demand their complete freedom in the West, even in that which are medieval practices, and at the same time, deny followers of other religions basic human rights in Islamic countries. Even more unbelievable is the acquiescence and tolerance of free nations in such hypocritical behaviour. All nations of the world must demand equality of all citizens in Islamic countries from their governments or sever all ties with them. Moderate Muslims too must act decisively in accepting and celebrating all beliefs in their countries before their religion is relegated to the ranks of bigots and fanatics; that is if they are writing the destiny of their faith. Obviously the stories I related are not fake, though another comment suggested that the treatment I referred to was not based on religion or culture. Obviously we met some genuinely kind people in Egypt too. Nobody among the Baha’is or their supporters is campaigning for Egypt to cease being an Islamic country, rather they are just campaigning for Baha’is to have basic rights of citizenship in their own country. I am an Egyptian Baha’i residing in the United States. I would like to assure you that the great majority of Egyptians are kind, loving, and caring. What you saw in the tourist area is not what you would see if you lived in Egypt. Poverty in Egypt is very high, and a small fraction of the poor people gravitate to touristic areas to make a buck (a pound). This often leaves tourists with the wrong impression about Egypt. The reactions you saw are not atypcial in the touristic areas. Middle class Egyptians receive the same treatment whether they are Muslim, Christian, or Baha’i. This is a small fraction of the poor class trying to make a living, sometimes at any cost. Most Egyptian Muslims are tolerant, and follow not only the letter but also the spirit of Islam. Unfortunately the Baha’is are being used as political scapegoats where political factions are competing as to who is more fundamental. This is ironic in view of the fact that Baha’is do not get involved in politics and avoid partisanship according to their sacred teachings. My Baha’i family in Egypt is going through a very difficult time, but at the same time they are optimistic that a country based on the spirit of Islam will fulfill its destiny of proving the true nature of Islam, that of submission to God’s will, tolerance, acceptance, and compassion. Let us pray that those responsible in government will see their errant ways of denying this small, sincere and loyal citizens their fundamental human and civil rights. The Baha’is in Egypt are not asking form more than to hold ID cards like any other Egyptian citizen. The Egyptian authorities need not do more than allow this simple right to their Egyptian brethren who are Baha’is. Forcing them to convert is not consistent with the spirit of Islam. Forcing them to lie in official documents is against the spirit of Islam. Ignoring their fundamental rights is against the spirit of Islam. The authroties need not recognize the truth or falsity of the Baha’i Faith. They need not accept any of the Baha’i beliefs. They only need to recognize that denying the Baha’is ID cards when they are made mandatory poses an extreme hardship on them that is not sanctioned by the Constitution, by the UN Declaration of Human Rights to which Egypt is a proud signatory, or by the spirit of tolerance that Islam is known for throughout its magnificent history.